When a person like Tim Sweeney speaks, people tend to listen. Right now Tim is hinting that his latest upcoming game title, Unreal Tournament 3, is going to like a lot of videocard memory. Of course, first and foremost is the need for a powerful graphics processor, next if your videocard budget allows, look for parts with 512MB of memory. That's quite a shift for the videocard industry, which has held steady with 256MB videocard memory capacities for the longest times. Now if you're still in DirectX 9 land, moving to a videocard that supports DirectX 10 (along with Microsoft Windows Vista, maybe on another partition) may be a good idea. Interesting DirectX 10 titles are popping up every week, and unfortunately DX10 is not supported by our beloved WindowsXP operating system. For better or for worse, gamers are going to have to make the plunge into Windows Vista soon. After a year or so of disarray from ATi, then the AMD videocard division after the two companies merged, the manufacturing and design problems appear to be tamed. Slowly but surely its entry level and mainstream products are reaching the market and just in time as some big game titles are on the horizon. AMD's Radeon HD 2900XT is a worthy competitor to nVIDIA's GeForce 8800GTX, but it's in the entry level and mainstream markets where AMD must go head to head against nVIDIA. The nVIDIA GeForce 8600 series already has a huge following, so it will be interesting in this review to see if the AMD equivalent, the Radeon HD 2600XT can stand its ground. 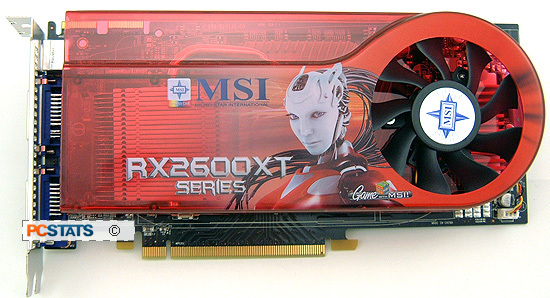 The Radeon HD 2600XT is a higher-end mainstream GPU, and on paper it looks every bit as good as nVIDIA Geforce 8600. The Radeon 2600XT had 128 bit GDDR2/3/4 memory controller, a 300 million GPU transistor count, is built on 65nm manufacturing, contains a drop of alien technology and basically has all the numerical specs of a winner. MSI Computer's Radeon RX2600XT Diamond videocard is what PCSTATS is testing out for you today, so here are the pertinent details. 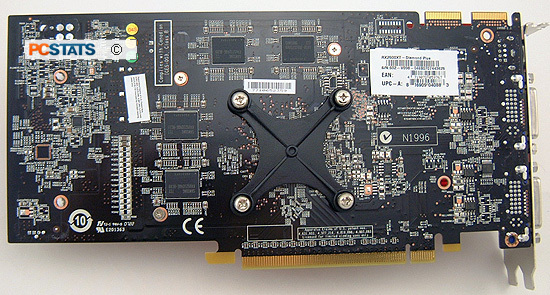 This PCI Express videocard has 512MB of GDDR4 memory, its Radeon 2600XT GPU is pre-overclocked to 850 MHz, and the memory to 2300 MHz; this is up from the default of 800MHz core and 2200MHz memory. It supports dual DVI output along with standard TV and component video outputs and even a special technology called Mazarine DVI. MSI bundle all the accessories you need to take advantage of the onboard video options, such as a S-Video/Composite cable, Component output cable and special DVI to HDMI converter which on this specific cards includes both video and audio signals.